You'll be pleased to hear Timetastic now has a full Audit Trail available in the Reports section. The purpose of the Audit Trail is to give you greater access to the personal data stored in Timetastic and visibility over changes to that data. It is after all, your data. I admit we really like GDPR for driving forward on functionality like this. 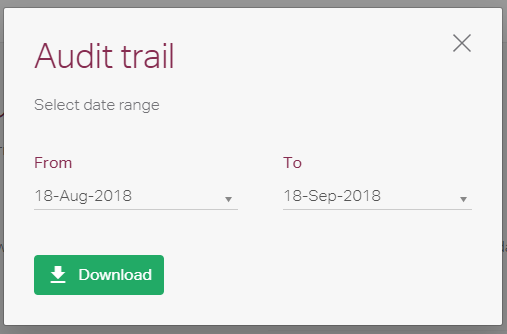 Pick your date range and click Download, in just a few seconds your audit trail will be available as an Excel workbook. What kind of activity is logged? Updates to users and the attributes in their profiles. Pretty much everything you can find in the SETTINGS menu item. Leave requests and bookings are not recorded here, they are detailed in the Annual Leave Summaries. The Audit trail covers your account settings and users. What they changed the setting to. Note: We started the collection of Audits as part of our work towards GDPR compliance and hence the data is only available from 20th of May 2018. As with everything, there's more information in our help centre and if you've got any questions or feedback about the audit trail, please get in touch. I'm on the engineering team and also proofread a lot of the content on this blog.